11/10/07, Walker Art Center: In curating the Walker's New World Jazz mini-series, Philip Bither defined jazz with a broad brush. Earlier this fall, Dhafer Youssef brought trancey, rhythmic Sufi-inspired music and cutting-edge musicians to the McGuire Theater. The final two events were scheduled for November within a week of each other, and they could not have been more different. 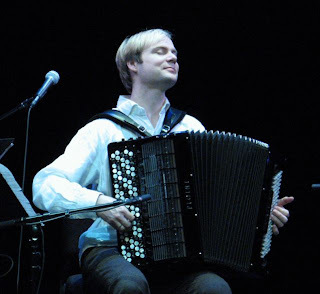 Being half-Norwegian and a former accordion player, I was predisposed to like acclaimed young Norwegian accordionist Frode Haltli. He was charming and personable when he spoke—he told us about coming to Minneapolis as a pre-teen with his church group—but his music made me impatient and drowsy. Haltli records for the great label ECM, home to artists including Keith Jarrett, Pat Metheny, and Charles Lloyd. The acronym stands for Editions of Contemporary Music, but I'm beginning to wonder if it means Extremely Coma-inducing Meanderings when Scandinavian artists go into the studio; pianist Tord Gustavsen also records for ECM, and he put us and our friends to sleep when he played the Cedar in April 2005. Haltli was joined by three musicians who would have been more interesting if two hadn't been underused. 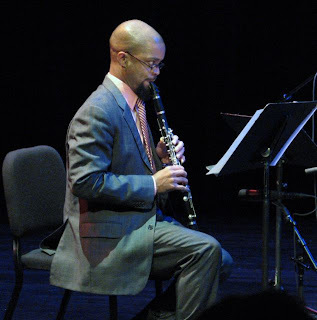 American clarinetist Darryl Harper has performed and recorded with Dave Holland and Tim Warfield and he tours with Regina Carter; Norway's Nils Okland plays violin and Hardanger fiddle. Both took back seats to Haltli and Maja Ratkje, a Norwegian composer and vocalist. Haltli explained that his music blends traditional themes with new sounds. One tune, "The Letter," was about a young boy writing to his parents about emigrating to America; that could have been about my grandfather. Another was about trees and the spaces between them. When Haltli played more than one note, the music was often very beautiful. He also used interesting effects: bending notes, making the instrument breathe (long whuhhhhhhhhh sounds from the bellows). In his introduction, Bither described Haltli's music as soundscapes. Partway through the evening, I started seeing landscapes in my head: surrealist Yves Tanguy-type landscapes with long stretches of nothing punctuated by the occasional puzzling object. Much of the music seemed bleak and too slow. Often it featured Ratkje's vocalizations, which took the form of wails and aye aye nee nee sounds. At least one piece (the title track on his latest CD) was written by Ratkje; Haltli told us it was titled "Passing Images" and said, "It is up to each and every one of you to decide what it is about." It opened with a long silence followed by low notes, more silence, low notes, silence...no one in the audience dared to move. (At Orchestra Hall or the Ordway, those silences would have been invitations to cough.) Everyone turned pages of the music on the stands in front of them, but I had no idea why, because little was happening. Then Ratjke leaned into her mic for some Norwegian scatting. A few days later, I spoke with someone else who had seen Haltli and his quartet. His favorite part of the evening was Ratkje's singing. A mutual friend who was also there thought "Passing Images" was the high point. Curious about the accordion? Sure you are! Photographs: Frode Haltli, Darryl Harper.